Medalist Series Gun SafeThe Medalist Series is our most popular safe—and for good reason. It offers excellent security, fire protection, and quality at an attractive price. Features include: 12-gauge American-made steel body, precision four-way active boltworks, and 1350° 60-minute fire rating. After careful examination, you’ll find the Medalist surpasses all other safes in its class. In fact, you’ll find it superior to most higher-priced products Built with many features our competitors can’t afford to offer—thicker steel, the famous Sargent & Greenleaf™ lock, internal ball-bearing hinges and 100% active door bolts. 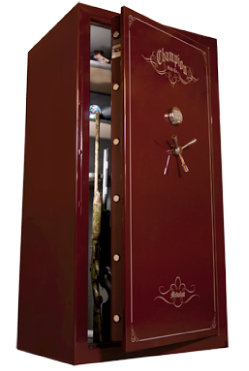 The Medalist Series gun safe offers excellent security at an affordable price.